It’s worthy of attention that Azerbaijan has recently become the venue for the latest technological innovations in the world. The Robokeeper- the fastest goalkeeper in the world will be brought to our country with the support of the Ministry of Transportation, Communication and High Technologies. Robokeeper will be presented in Bakutel-2018, the 24th Azerbaijan International Telecommunication, Innovation and High Technologies exhibition to be held with primary sponsorship of Azercell Telecom LLC on December 4-7 this year. Robokeeper is considered the most competent and fastest goal-keeper in the world. This invention of German scientists is based on ultra-modern and unique technology. Therefore, Robokeeper is almost impossible to score a goal. This “smart goal-keeper” catches practically every strike and never misses any. The complex technology allows the goal-keeper to react to every strike immediately. Even some of the world's best professional football players, such as Messi, Ronaldinho, and Neymar, have had to experience, how hard it is to score against the RoboKeeper. This time, well-known football players from Azerbaijani clubs will take a turn to shoot Robokeeper. Gurban Gurbanov, head coach of Azerbaijan National Team and Garabagh club and other football-players who are invited to the opening ceremony of Bakutel-2018 exhibition will contend with Robokeeper. Not only the Azerbaijani football players, but also the guest and attendees of Bakutel-2018 may take a shot to compete with Robokeeper. Those who win Robokeeper will receive presents. The main sponsor of the exhibition Azercell will award every scorer with 10 AZN worth balance card and other gifts. Everyone, including women and children, can participate in this exciting entertainment. 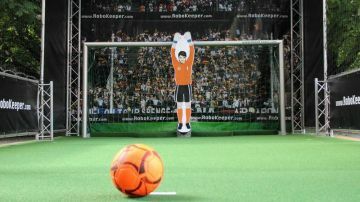 It is only necessary to kick penalty as in real football game to compete with Robokeeper. Robokeeper, which exists only in 10 copies in the world, is welcomed everywhere with great interest. People stand in queues to score this smart goalkeeper. Notably, on May 29 next year, Olympic Stadium will host the final match of UEFA European League. Just on this eve, the demonstration of Robokeeper technology in Baku will further increase the interest in a sport, particularly football among the youth. “Azercell Telecom” LLC has been the most active participant and primary sponsor of Bakutel exhibition to be held for the 24th time in Azerbaijan. The company has demonstrated various technological innovations for the first time in Bakutel. Azercell’s stand has always gained the great interest of participants and guests. The company has organized live performances, games, quizzes and other entertainments. This year, Bakutel will exhibit the advanced Technologies in ICT and offer a platform to create new business relations. The attendees will also have great fun at the exhibition.